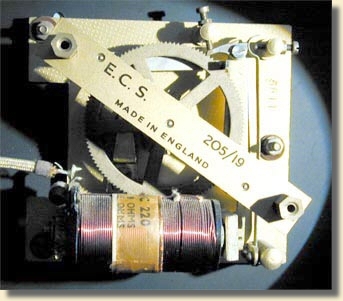 The master clocks with a 1 second pendulum provide a pulse every 30 seconds for the advancing of the slave dials. 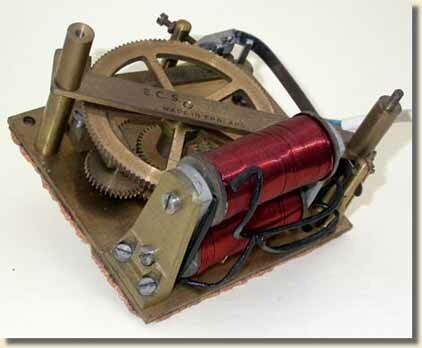 The pulse is always of the same electrical polarity, and actuates an armature and pecking pawl to advance an index wheel. 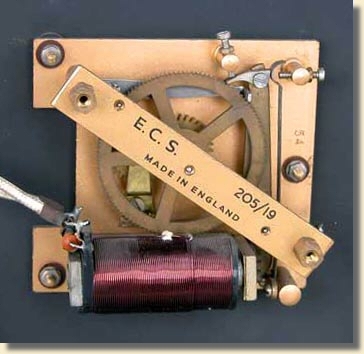 The movements for ECS slave dials were made by Smiths English Clocks Ltd and were generally marked with the initials 'ECS' and the type number written on the bridge plate of the movement. 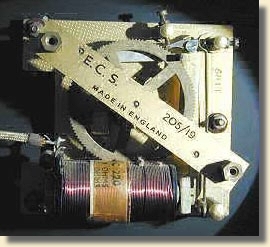 Very early slave dial movements, such as the one illustrated on the left, were marked with the initials SEC (for Smiths English Clocks) and were designed with a paxolin index wheel. The later movements were made with a brass index wheel as shown in the right-hand example. For more details of the standard slave movements, see Design Progression further down this page. Many styles of case and dial were produced over the years, and examples are to be found illustrated on the 'Catalogues' page. Most dials for interior use are around 9 or 10 inches in diameter and use the light duty movement, type 205/12 or type 205/19. These light duty movements have an index wheel 47mm in diameter. 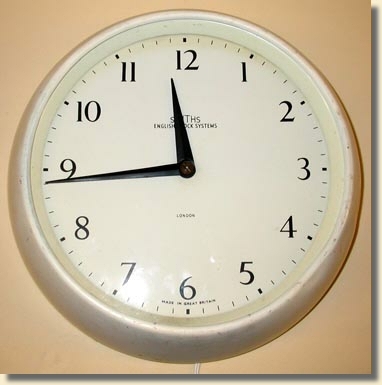 for larger dials up to 36 inches diameter. Larger dials for publicly visible clock dials were made, and used the heavier movement, type EW/245 which has twin coils (in series) acting on a single armature. The index wheel is 76mm in diameter. Slave movement type 205/28 for medium sized dials. 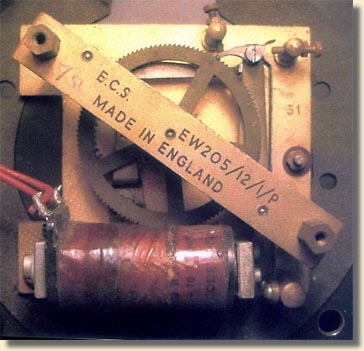 Only one example has been found of the movement Type 205/28 quoted in the ECS specifications below, (specified as suitable for mid-sized dials) and this was in the smaller programmer described in the Ancillaries section. Although in this case it was not driving a medium sized dial, the various contact sets presented a considerable load to the slave action. The index wheel diameter is 47mm, the same as the light duty movements. 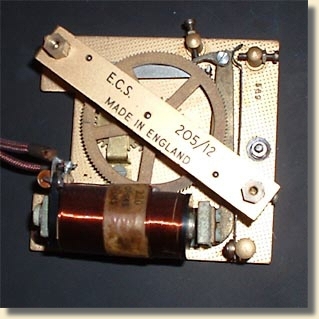 Dials were also made for the British GPO, to their own specifications, and had the GPO logo on the dial and the name of ECS on the rear cover and on the movement. SERIES 1/2 MINUTE SLAVE MOVEMENT SPECIFICATIONS. Coil resistance	 Shunt resistance	 Combined resistance	 Operating current	 Coil part No. Coil - 730 turns 26 SWG enamelled copper wire. 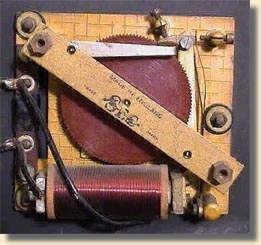 Coil - probably similar to type 205/12. Coil - 1000 turns 28 SWG enamelled copper wire. Referred to as a No. 3 movement. Coil - 1300 to 1395 turns 26 SWG enamelled copper wire. 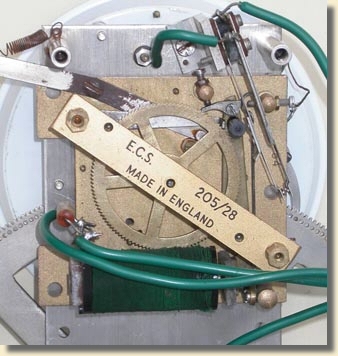 ECS states that the working and failing currents of the above ECS dials are the same as similar Synchronome dials, and that they are interchangeable. DESIGN PROGRESSION of standard slave. 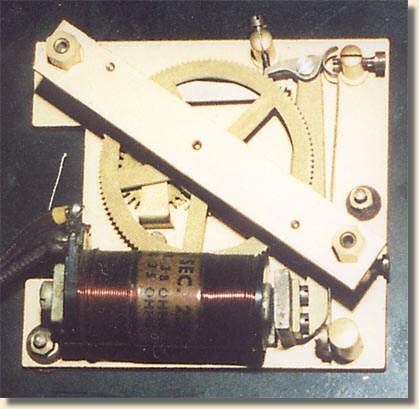 The design of the impulse movement in the half-minute dials can help to date a clock or dial. 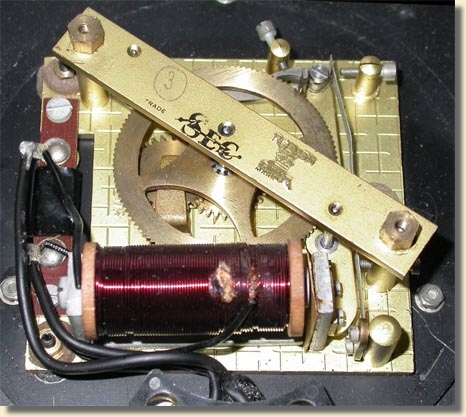 From approximately 1952 onwards, the dials were given a date code which was stamped into the square brass plate on which the movement is built. Initially this code was in the form of two digits for the year, followed by one or two digits for the month, e.g. 547 gives July 1954 and 5512 gives December 1955. Around 1961 or 1962 this code changed to become one or two digits for the month followed by one digit for the year within the 1960 decade. e.g. 113 is November 1963 and 54 is May 1964. Changes in the design of the 205/12 and 205/19 movements are shown by the following series of pictures. ACTUATING SPRING: Twin springs, straight ended. One spring acts on the armature, and the other on the tail of the index pawl. WHEEL: Resin bonded paper. Solid. MAKER'S NAME: Smiths English Clocks. 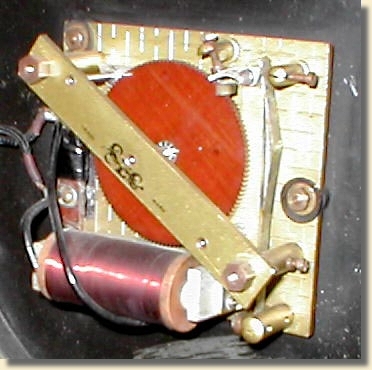 COIL: Enamelled copper wire, not covered; no part number. QUENCH RESISTOR: Resistance wire wrapped round paxolin strip. ACTUATING SPRING: Single spring, straight ended, acting on the tail of the index pawl. MAKER'S NAME: Smiths English Clocks. Also has name 'RELYON' stamped into bridge bar. From slave dial, movement marked GVIR (King George 6th, who died in 1952). ACTUATING SPRING: Single spring, curved end, acting on the tail of the index pawl. TYPE NUMBER: 205/19 printed on bridge bar. 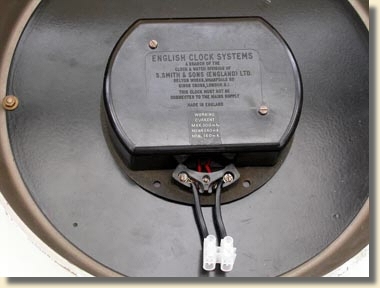 MAKER'S NAME: English Clock Systems. 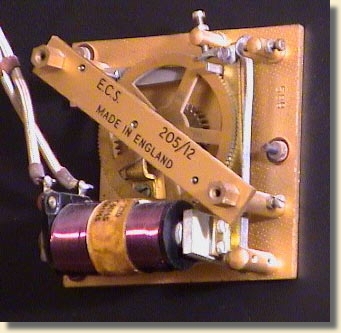 COIL: Enamelled copper wire, not covered; part number label. QUENCH RESISTOR: Carbon resistor soldered to coil tags. TYPE NUMBER: 205/19 printed on coil only. MAKER'S NAME: None on bridge. SEC on coil label only. TYPE NUMBER: 205/12 printed on bridge bar. ACTUATING SPRING: Single spring, curved end, acting on the tail of the index pawl.. TYPE NUMBER: 205/12/1/P printed on bridge bar (GPO code). 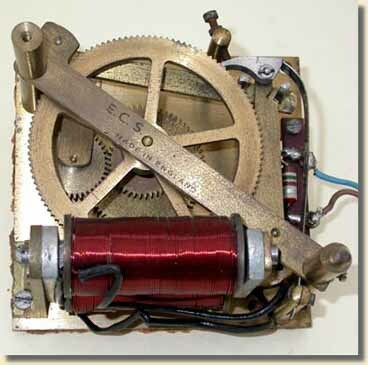 COIL: Enamelled copper wire, covered; part number label. 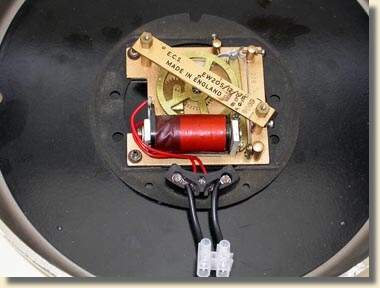 QUENCH RESISTOR: Separate winding of resistance wire on coil former. From a GPO slave dial. 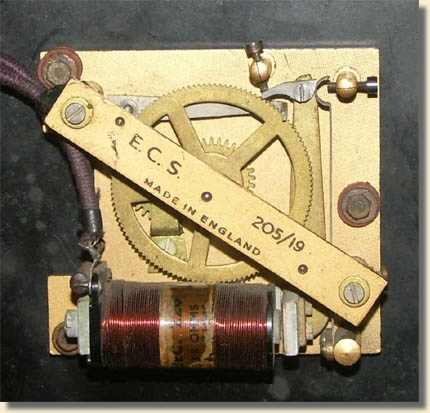 COIL: Enamelled copper wire, not covered; no part number label.